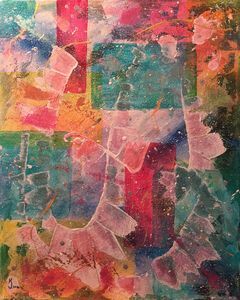 "Mardi-Gras" is an original textured mixed medium abstract painting on canvas by internationally awarded fine artist, KJ Burk. 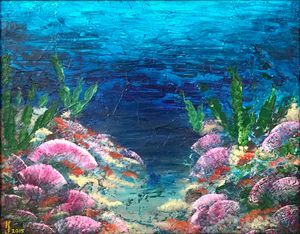 The original painting has been sold to a private collector and is currently on loan for display purposes at the Ozarks Art Gallery in Hartville, Missouri. KJ Burk is an internationally awarded fine artist whose work is collected by distinguished fine art collectors, galleries and corporate offices around the world. 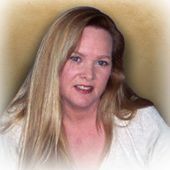 KJ first rose on the NYC art scene in the mid 1980's, then in the San Francisco Bay by the early 1990's. KJ stopped creating art completely in 1994 while enduring an abusive relationship. 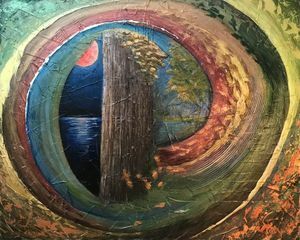 Today, after a 20+ year hiatus from painting she now creates magnificent pieces of light and beauty at her private studio on her farm nestled in the heart of the Ozarks countryside. It is rare today to see one of her works in an art show since most of her time is dedicated to caring for her severely autistic son. KJ's line of "Christian & Spiritual Art" can be found at the Ozarks Art Gallery in Hartville, Missouri. Several of KJ's smaller pieces can be found at Roxy's Gallery of Local Art Expressions on Spring Street in Eureka Springs, Arkansas. KJ provides FREE art demonstrations at the Ozarks Art Gallery on the first Sunday of every month from Noon - 2pm.